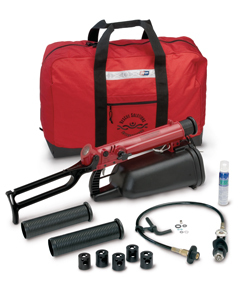 Everything you need to launch a 1/8 in (3-mm) messenger line up to 350 feet (107 m). The 500-foot (152-m) Dacron® line has a tensile strength of 2.2 kN (500 lbf). Once you have the messenger line across, use it to pull across the rescue rope. Training CD Additional ResQmax™ products are available by special order.